Conference time | Thinking is the enemy. ← Hey, dude-bro. ‘Sup, brah? 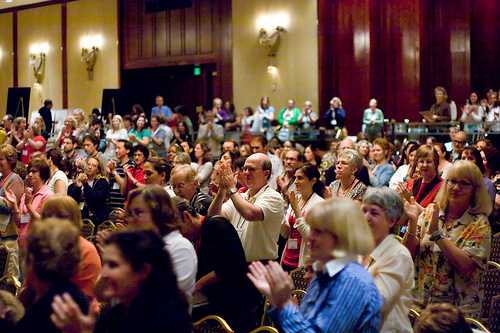 Standing room only at the 2008 SCBWI conference in Los Angeles. Photo by Rita Crayon Huang. So I’m off to a conference this weekend — the regional conference for the Carolinas chapter of the Society of Children’s Book Writers and Illustrators, of which I’m a member. This will be my third SCBWI Carolinas conference, and I’ve really enjoyed the other two. You can get professional feedback and critiques, the breakout sessions are informative, and the people are very supportive. I don’t know if SCBWI is unusual in this regard, but the generosity of published members in helping others is wonderful. In addition to the conference, I’ve also found SCBWI helpful in forming a local writing group. Science Fiction and Fantasy Writers of America. Know of another one? Please share it in the comments. This entry was posted in Support and tagged conferences, SCBWI, writing. Bookmark the permalink. Header image adapted from Reilly Butler under a Creative Commons license.